A hot blend of sun-ripened lemons, garlic, spices and African Bird's Eye Chillies. 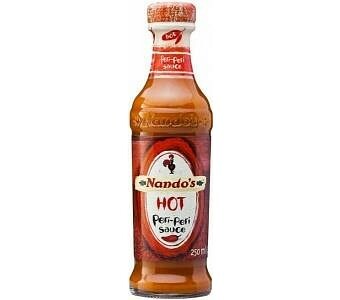 If you are PERi-PERi serious when it comes to heat, this is for you! Kosher (Parev) Halaal (NIHT) Vegetarian (Vegan) No Artificial Colours No Artificial Flavours No Added MSG Colour may vary due to the nature of some ingredients No Artificial Preservatives No Artificial Colours No Artificial Flavours No Added MSG Heat level: Hot Directions for use: Nando's PERi-PERi is delicious with anything you can get your hands on. Keep adding it to reach your desired heat level Allergens: Na Made in a facility that also processes product with gluten, wheat, eggs, milk, tree nuts, peanuts, soya, sesame seeds and their derivatives.